The spectacular gardens at Arley have been voted amongst the best in Europe. These award winning Grade II* listed grounds cover over 7ha. 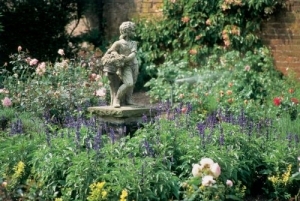 The present gardens were heavily influenced by Rowland and Mary Egerton-Warberton in the mid-nineteenth century, although there have been some alterations since. One of the highlights of the gardens is The Ilex Avenue, with 14 very distinctive evergreen holm oaks. Other gardens include the kitchen and herb gardens, as well as a scented garden constructed much more recently in 1977. Beyond the house at Arley is The Grove, planted with much wilder species in a less ordered manner. Typical species here include oak, birch, beech, acer, cornus, pieris, kalmia and many more. Voted one of the top 50 gardens in Europe, Arley’s award winning Grade II* listed grounds cover over 7ha. They embody all that is best about English horticulture with breathtaking colour, lavish planting and a tranquil, beautiful rural setting. A garden has probably existed on this site for several centuries, but the earliest recorded evidence can be found on a map dating from 1744. This shows large beds that may have been planted in ‘knot’ fashion during the 17th century. On the site of the present gardens were broad paths that ran amongst fruit trees and vegetable plots. The current gardens were created by Rowland and Mary Egerton-Warburton in 1846 – and while successive generations have added to them, the traditional character and basic design have been retained through the last 160 years. The entrance to the garden is down an avenue of pleached lime trees leading to a Clock Tower. Beyond this is the Flag Garden, named after the stone flags that form its paths. Here the central beds, which are planted with floribunda roses and dwarf lavender, are complemented by attractive wall plants and yew hedges. Perhaps the highlight of a visit to Arley’s gardens is the double herbaceous border – said to be the oldest example of its kind in the U.K. It is shown on the original 1846 garden plan and many of the original plants are still used. Colours change throughout the year, with early summer exhibiting a restricted palette of pale blue, mauve, yellow, white and silver. During July and August a profusion of rich warm hues are added, tumbling in an ordered chaos of flower and foliage. Nearby is a little half-timbered building known as the Tea Cottage – which was once used for tea parties. This is now surrounded by shrub roses and a mix of herbaceous planting, including geraniums and campanula. At the end of the herbaceous border is The Ilex Avenue that helps lead the eye into the parkland beyond. 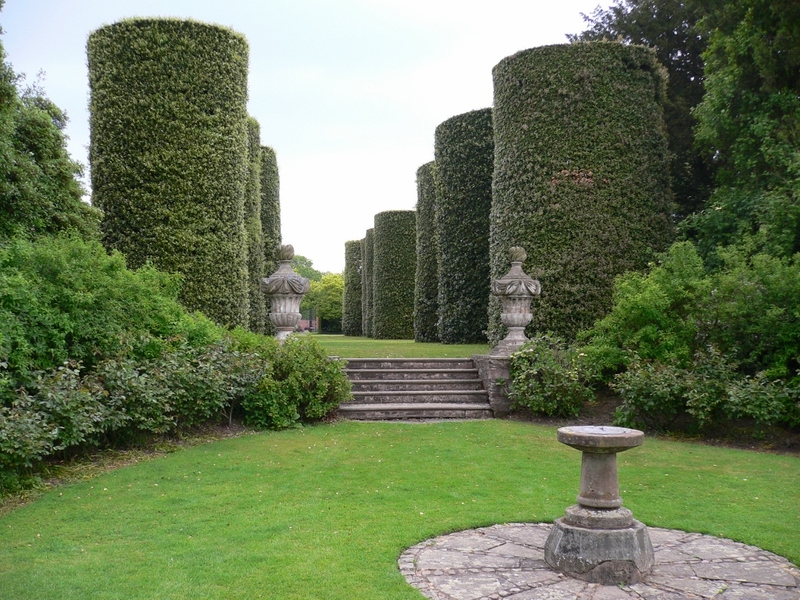 These 14 evergreen holm oaks are clipped into an unusual and distinctive cylindrical shape and are one of Arley’s most famous features. Close to the Ilex Avenue is the attractive Fish Garden containing a statue and small pond – and from this, visitors can explore the Rootree, with its shaded damp soils home to ferns, salix, candelabra primula and some varieties of azalea and rhododendron. Arley’s Walled Garden is a more recent addition, having been a kitchen garden until 1939 and later a market garden. In 1960 it was incorporated into the pleasure grounds, with additions including a pond and heraldic beasts taken from the roof of a demolished wing of the house. A wide variety of shrubs and foliage specimens adorn the borders planted along the walls. Elsewhere at Arley are kitchen and herb gardens, as well as a scented garden – first planted in 1977. Beyond the house is The Grove, which is an area of woodland and shrubs that has been restored and planted since 1970. There are a wide range of species, including oak, birch, beech, acer, cornus, pieris, kalmia, magnolia, prunus, liquidambar, sorbus and malus as well as numerous types of evergreen, conifer and over 300 varieties of rhododendron. The present house at Arley dates from between 1832 and 1845 and stands on the site of an earlier property dating from the 15th century. Events, exhibitions: Various events throughout the year from car ralleys to plays and ‘Wizard week’. Tea Room / Restaurant on site. Tudor Barn licensed restaurant with seating both inside and out. Children’s programme: New playhouse situated within the picnic area with games such as noughts and crosses.